Very quiet night tonight with just my bed-stricken mum and I at home. She's in a lot of pain tonight. If only there were some way I could take some of that pain away from her. Anyways onto some fun stuff; I was thinking of things I could do at home on a Saturday night. FreeBSD! I need to update my ports collection a bit more often… the portmanager -u update is going to be a big one this time! Shows though how little maintenance you need to keep a FreeBSD system running just nice. As I was watching my local repository of free goodies update itself without me needing to do anything I got to thinking: damn it, I just love FreeBSD! Why? It's all just so cohesive and efficient damn it! 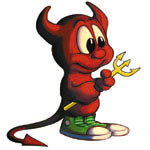 Don't get me wrong, I still think Debian GNU/Linux is all good and Mac OS X is still spiffy, but FreeBSD rocks! Anyway it's getting damned late and I need to shutdown -p now myself, if you know what I mean ;).